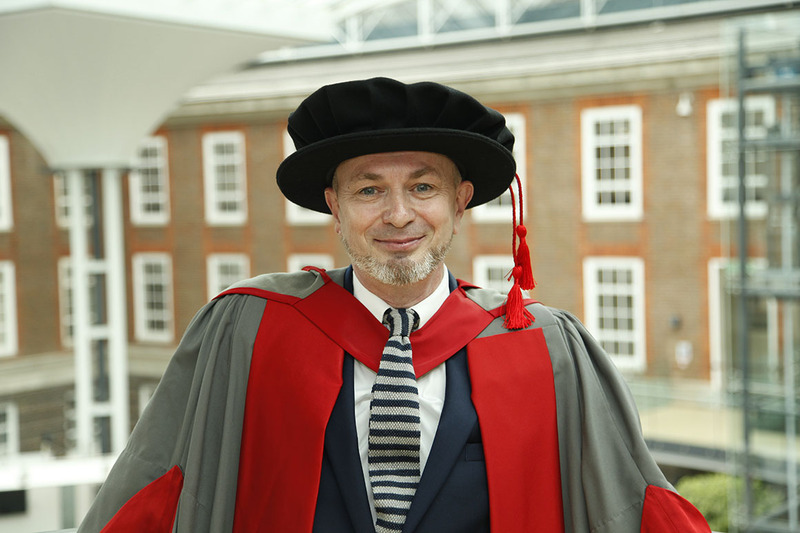 Internationally-renowned dance educator and Middlesex alumni David Steele has been awarded an honorary degree by Middlesex University. He was presented with the award at the University's graduation ceremony on Friday 17 July. London born David's work across the world has been influential in bringing dance to the forefront of the education system. He led the team that put in place the first Bachelor's degree in Contemporary Dance in France, followed by a Master's degree, both with the collaboration University of Paris 8. His dance career began when he graduated from the then Middlesex Polytechnic in 1983 with a BA (Hons) in Performing Arts. His career spanning three decades has seen him take on senior roles within the Laban Centre, the Centre National de Danse Contemporaine (CNDC) in Angers, France and the Conservatoire National Musique et Danse, Lyon. Now the current Vice Principal and Director of Studies at the London Contemporary Dance School, David has been recognised by Governments across Europe. He was made a Chevalier dans l'Ordre des Arts et des Lettres (Order of Arts and Letters) by the French Government in recognition of his contribution to contemporary dance, and the director of DanseProjeket, an artistic and educational venture, from the Ministry of Culture in Copenhagen. During this time in Denmark, he led an initiative to establish the first state education in the field, going on to be Rector of The School for Modern Dance in Denmark, a state education under the Ministry of Culture. Ahead of honorary graduation, David said: "I am deeply moved and profoundly grateful for the award of Honorary Doctor of the University. I will always be thankful to the Middlesex University for having had faith in me when, many years ago, I came seeking a place with almost no formal education. The faith that Middlesex then showed in me, and their decision to let me become a student, quite simply transformed my life." Middlesex University Vice-Chancellor Professor Tim Blackman said: "We are always thrilled to see our graduates become so well respected and influential in their chosen careers. David Steele is a leading figure in contemporary dance and influences generations worldwide. We are delighted to have welcomed him back and present him with this award."